"A beak tapping at a window... The shadow lurking in your car... The castle on the hill... An unexpected visit... A horrible feeling in your chest... 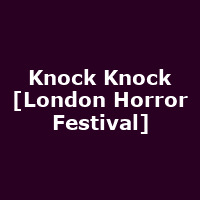 Knock Knock... Five tales of terror, find out who's there... Each story; a unique horror genre - literature, slasher movie, gothic, ghost story and sci- fi - Something for every type of horror fan! The Underground Clown Club and Gavin J Innes take a twisted, comic look at a host of horror genres and the evils that wait behind a knock at the door..."